We won! 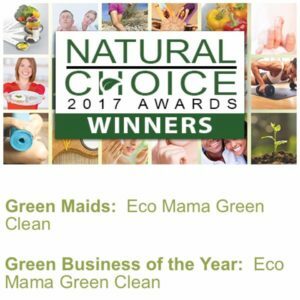 We made winner in 2 categories; Best Green Maids, and Green Business of the Year from our local Natural Awakenings Phoenix Edition Magazine! This comes right after winning Best Cleaning Service in Scottsdale from Best Businesses, bringing our grand total to 10!!!! I like the way “10 time award winning company” sounds. We have never had such a strong staff, and I am truly appreciative and proud of each team member at Eco Mama. Thank you to all who voted for us, to our staff, our clients, all of my amazing business mentors, my networking partners, friends, family, and supporters in general. For those of you just tuning in, Eco Mama was established in 2010, after I decided to give up the corporate world for the opportunity to use my entrepreneurial and creative energy to create a way for me to spend more time with my first son who was 1. It started as a bit of a hobby and side cash, and well when I get passionate about something, there is no holding me back. I found that before long I was helping to educate so many new moms about the effects of toxic chemicals in their home, and how dangerous it is, even while the baby is still in the womb, and even if the products are stored away under a cabinet not being used!!!!! Fast forward to today. That “baby” that I created this whole business for is entering 3rd grade already (gasp!). I now have a 3 year old and a 1 year old and have created this amazing award winning company. Some people make comments to me like “wow, you are so lucky, it all worked out”. I have to laugh. It has been the most challenging years of my life to build a company that I have to rely on other people to keep up the reputation that it took me years to build. Not to mention doing it with 2 babies, 18 months apart, and another child. It has also been incredibly rewarding and I truly care about each employee and each client. I believe that makes us stand out. This business is completely build on love. When you have love as your reason and your “why”, it’s magical. Now this is my very first blog, so forgive my rambling. Check back for more, because not only will I ramble again, but I will post useful and helpful information to help you keep a clean green home.